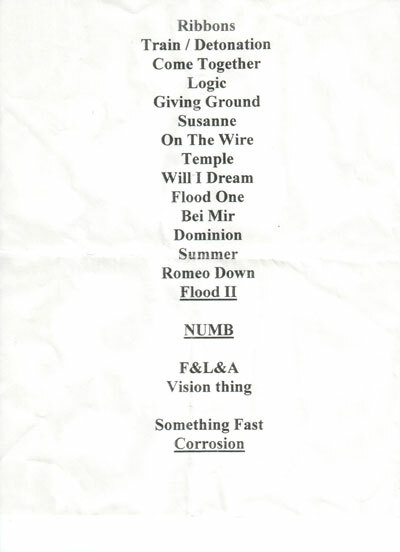 This setlist was used for the second part of the tour; premiered in San Francisco, it was followed verbatim in 5 dates of the tour (Atlanta's setlist is unknown, and it's quite possible that it was the sixth date). Earlier gigs followed the same list, albeit very freely. 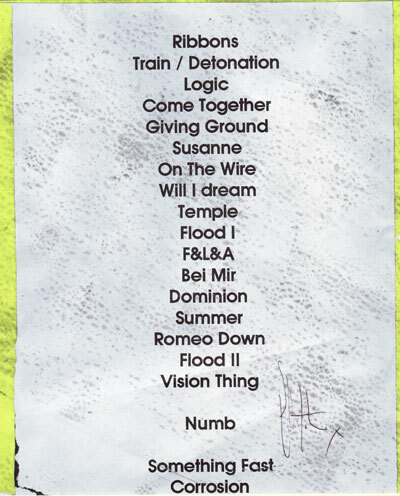 And the setlist very much reminds the one from the last tours. This move copies the then-surprising pattern of Event Horizon -- most of its late gigs had identical list, or its very close variation. 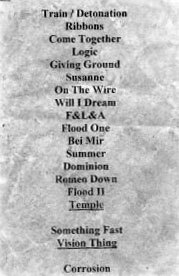 Same as back then, the "standard" setlist (and most shows) had 19 songs -- this in contrast to Summer'98 when the band was willing to play all 21 songs whenever they had a chance. Summer was a short six date affair, so its best to compare the To the Planet Edge setlist to previous tours; and when comparing it to Distance Over Time and Event Horizon tours with 26 songs in repertoire a decline shows up: only 25 different songs were played in 1999. How do we open this? Intro music this time around was exclusively Tangerine Dream's Fly and Collision of Comas Sola, with exception of the pre-tour gig in Braga in which Afterhours was inserted just before Sisters performance. This breaks tradition of previous years when Afterhours was the preferred intro, with Comas Solo was often played before it, and only very rarely instead of it. Unusual feature of this tour were the openers: most gigs in the first half of the tour, starting with New York, opened with Train/Detonation Boulevard, and later Chicago became first and last gig to open with Temple of Love. Neither song was used in this place ever before. Remaining gigs were opened with Ribbons, and the first USA gig in Washington kicked in with Vision Thing. Jolene, Kiss the Carpet and Under the Gun, all last played in Event Horizon, were stripped in Summer and didn't reappear this time around. Two songs skipped in Summer reappeared: Alice and Body Electric, both in their usual "live surprise" mode. The remaining three live surprises were the inevitable Sister Ray medley and two songs formerly played in every concert since their introduction: Anaconda, the fast version, first played in 1993 Overbombing tour, and War on Drugs, the unreleased song, introduced in in 1997's Distance Over Time. Alice and Anaconda were only played once, War on Drugs and Sister Ray -- twice, and Body Electric count reached monstrous four. Comfortably Numb/Some Kind of Stranger was only present in six dates. What did Sister Ray say? The ubiquitous Sister Ray was played live twice -- in the closing date in Mexico City, making it the final song of the tour, and in Philadelphia, where it was called up by the audience: responding to semiaccidental Sweet Home Alabama's riff the crowd cheered faithfully enough to convince the band to return and play that song together with the rest of Sister Ray medley. Both Lucretia and Walkin' the Dog were included in both performances. Click here to read the story of Sweet Home Alabama, brought to you by Sisters archenemies New Musical Express's special 100 Rock Moments. But the biggest surprises of them all were the two tracks: Flood I, never played before masterpiece, and Bei Mir Bist Du Schön, the latest addition to the long string of live covers (20 with this one, 21 if you rank several impromptu lines of Always Look on the Bright Side of Life as a cover, even more if the half-baked "covers" included in recent Sister Rays are counted). In New York, Andrew perfectly summed up the feelings associated with Flood I: "Bet you never thought you'd hear that one." This addition is fifth song from Floodland ever played live, and of the remaining three, only Neverland retained full studio purity -- tiny fragments of 1959 and Driven Like the Snow were performed between songs in 1992/06/27 Birmingham gig. The choice of Bei Mir Bist Du Schön, made popular by pre-war sweeties Andrews Sisters as a cover continues Andrew's traditions to cover songs of female singers (Dolly Parton's Jolene, Abba's Gimme Gimme Gimme), although this cover is less grotesque. Some might explain the choice by suspicious familiarity between the name of one band and the state of the things in the other. Others might notice how this happy love song doesn't fit goth image Andrew is trying to lose. The story of the song is told in the next chapter. "The song was originally in Yiddish (not Hebrew! ), written by Jacob Jacobs with music by Sholom Secunda. The English translation, originally performed by The Andrews Sisters (Maxine, Patty and Laverne) and faithfully rendered by Mr. Andrew, was done by Sammy Cahn and Saul Chaplin in 1937 (original copyright 1937 Harms Inc./J&J Kammen Music) and includes words in Italian and German/Yiddish (the "Yiddish" words in the English version are really German - Yiddish being a mix of Hebraic and Germanic components). Original Yiddish text was written by Jacob Jacobs, music composed by Sholom Secunda. "[In New York] I was right in front of Adam, who seemed amazed that this redhead knew all the lyrics to this "unknown" song; I believe I was the only one in Roseland singing along at this point. "....And for all of you Americans who don't know who Sammy Cahn is, well, that's a shame. He wrote the lyrics to great deal of the memorable music of this century. He was also the man behind Sinatra - the word and phrasing came from Sammy, as well as the debonair fedora look." Sammy Cahn also wrote words to Love and Marriage, sung by Frank Sinatra and made famous by Andrew's favourite Married with Children series. For more information about America's Wartime Sweeties, turn to Yahoo's entry. CDNow feature Andrews Sisters section with downloadable samples of the original Bei Mir (featured in numerous greatest hits albums, for instance, Their All-Time Greatest Hits). Alexandre Barette (a.barette@rol3.com) with lepi@uni-muenster.de reported that shortly before the tour "Bei Mir Bist Du Schön" was covered by German dance band "Q Connection", which was good enough to enter the local Top 100. In the song, a female is singing Yiddish lines, and the rest is rap. worth mentioning are also 1999/09/25 Philadelphia and 1999/10/21 Mexico City, which both included Sister Ray and Comfortably Numb/Some Kind of Stranger and both had 21 songs -- no other gig lived up to that. The Mexico City one flavoured the otherwise standard setlist of end-tour with two additional encores, so if you get this one, you're getting the taste of what was in most USA shows, plus two great additional songs.